Our refugee coordinator Graham Thom, along with our national director Claire Mallinson and board vice president Jim Sharp, has just visited the new Christmas Island detention centre. These are their observations. There are a few things that strike you about Christmas Island and its new detention centre. Firstly, the island's remoteness from the Australian mainland, and the logistical difficulties in getting there, are brought home when you depart Perth's international airport, passport in hand. You have to complete an immigration departure card, despite the fact you are flying to an Australian territory ('excised' of course), before embarking on a five hour flight to the island. 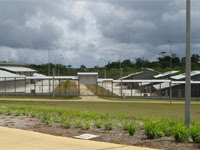 On 13 August, Amnesty International Australia joined a number of other NGOs, UNHCR, HREOC and the Ombudsman's office on a visit to the newly completed Christmas Island detention centre. The visit was organised by the Department of Immigration. Once on the island you are struck by not only the remoteness of the new centre to anything else on the island but also the high level of security surrounding the centre. (Where would anyone escape to?) Two high fences, the second one an electric fence, circle the perimeter. Despite landscaping in the "green heart" of the centre there is an all pervasive feeling of concrete and steel, particularly in the accommodation compounds. Despite recent efforts to improve the feel of the centre you cannot escape the sense you are in a medium security prison. The level of fencing and surveillance make even the recreational areas, including sewing room and beauty saloon, feel like you are in an expensive cage. In the accommodation rooms the small windows are covered by steel mesh that obscure the view to the nearby fence and then the larger electric fence beyond that. Most confronting of all is the arrivals area, the "at risk" area and the high security "red one" compound. It is difficult to imagine how traumatised asylum seekers would react when first brought into the centre. This arrivals area at best can be described as harsh and soulless, but at worst, for someone who has previously suffered torture or trauma in their homeland, it would be anywhere from intimidating to frightening. Even the light fittings are surrounded by cages. The "at risk" rooms are part of the modern medical facility. These are rooms where people who it is believed could potentially self harm can be monitored. The rooms themselves again demonstrate the priority of security over individual well being. This is reinforced when you go out to the adjacent open small caged area, designed to let those in the at risk area go "outside". How it is envisaged that people suffering mental health concerns will improve in these conditions, rather than go into serious decline, is difficult to comprehend. The "red compound" where those who pose a security concern, or behave violently, is also very confronting. Again, the thought of anyone's "behavior" improving in such a maximum security environment is difficult to imagine. Amnesty International Australia has consistently raised concerns about detaining people in remote locations, particularly in dehumanising environments. The damage this has done to the detainee's mental and physical health has been documented time and time again. The high security nature of the new centre is clearly reflective of previous detention philosophies and we believe is a long way from the current vision of a more humane approach to detention outlined recently by the Minister. While on Christmas Island we were also shown some of the other alternative detention arrangements available for use on the island, including duplexes situated in the community and the previous phosphate hill facility which has recently had a number of the fences removed. This would enable any future detainees to come and go from the facility during the day. While the remaining fenced in areas still feel confronting the rest of the basic cabins in the centre makes it feel like an old school camp ground. It is envisaged that if people are brought to the island these facilities would be used in preference to the new $400 million centre, which would only be used as a last resort. The clearly more humane approach that is being taken with other detention alternatives on the island again brings in to stark contrast the absurdity of building such a harsh, high tech, high security facility like the one that has just been completed. The resources within the new centre, computers, sports equipment, sewing machines and the cost of maintaining them while the centre remains empty is a situation that can best be described as extraordinary. Flying back to the Australian mainland, passing the duty free before again clearing customs, it is difficult to image a more remote part of Australia to build a high security detention facility. Maybe that was the point seven years ago, it is now time for the current government to abandon that approach and treat all those who are fleeing to this country in search of safety with the same level of dignity and respect as everybody else.